Coming in 2019! Summer Market Days! Location: Community Events Area, Kelsey Dock Plaza. Starting June 1st and ending August 31st, the City of Valdez will be hosting on Saturdays, a weekly market. 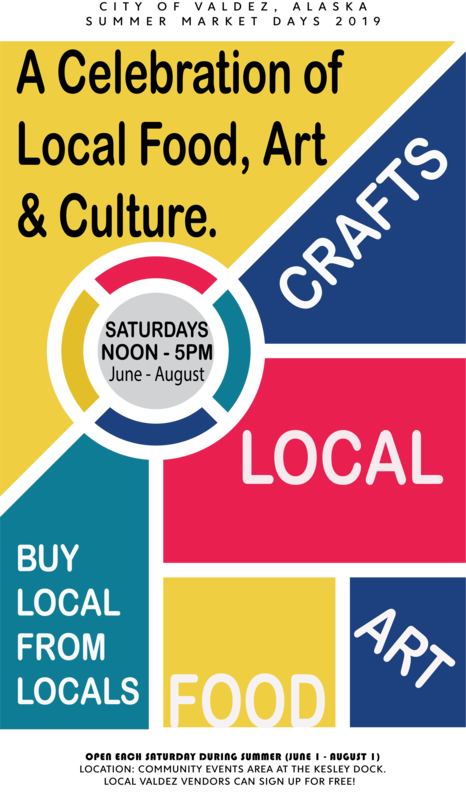 Artisans, Food, Local Craft and so much more! Are you interested in having a Booth? Vendor Sign Up is NOW OPEN!! You can download the application form HERE! or pick up a copy at City Hall Front Desk. Vendor Booth Registrations must be handed in no later than May 10th 5:00 p.m.